Three City Council members emphasized the opportunities for Seal Beach in 2019, according to responses from an informal email survey. The opportunities listed included the likely re-opening of the Bay Theatre, and repairing of the city pier, and hiring new Seal Beach Police Department officers. The challenges they cited included helping businesses and ensuring public safety. The Sun followed up with phone calls and emails. Due to apparent problems with email, one council member received the question immediately and another found it in their spam folder. The following are the answers received to date, starting with the mayor’s and then in order by district. Email replies have been edited for spelling and punctuation. “Here are my comments for challenges and opportunities. 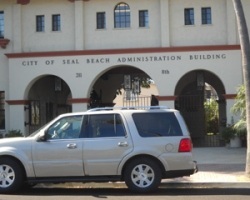 “This is going to be an exciting year for Seal Beach. In 2019, both the Pier and the Bay Theater will be re-opening. The City Council will for the first time in the next few meetings have digital agendas saving our City staff many hours of printing copies of the agenda items and eliminating the need for hand-held delivery for each meeting. If there is technology that will help save time, money and effort for the City in a certain area, I’d like to see the City take a look to determine if there is an opportunity to use it. “One of my priorities this coming year will be to ensure communication is strengthened between the City and residents in Seal Beach with the ultimate aspiration of making residents aware of the many ways in which they can participate in the governance of their town. Additionally, my aim will be to make residents aware of all the exceptional programs and services provided by the City. By reinforcing the communication bridge between the City and the public, we will inevitably advance the goals and objectives of our community. “Also, I know it is increasingly challenging for small businesses to grow when rent increases along with wages and other expenses. I’d like to see the City be even more effective in helping businesses in Seal Beach to try to streamline permits where feasible and be a bit more flexible so that businesses can continue to grow and thrive which will help accelerate the recovery of Seal Beach’s fiscal condition. “I have had some residents from Leisure World contact me concerning pedestrian safety and I plan to discuss this at the next Leisure World / Seal Beach Committee meeting to explore what can be done. The meeting will take place within the next few months. “1) Make sure our Neighborhoods are safe and secure using funds from Measure BB. “4) Evaluate the City’s methods of financial transparency and improve upon them when necessary. “Overall, I am very positive about this next year. Residents of Seal Beach will see superb progress and continue to enjoy the marvelous city that we live in. “2019 will be an exciting year for our little town. The Bay Theater will be opening; the pier will be fully repaired and opened; new police officers will be added and the Jack Haley Building used as originally intended; the new park on 1st should be completed and opened; and hopefully a new restaurant will be open on 1st Street at the river. Opportunities abound to keep our little beach town the best on the coast. “Challenges always accompany opportunities as we continue to find solutions to flooding, homelessness, traffic impacts from the 405 widening, developments in Long Beach and Huntington Beach as well as the challenge of putting together a Local Coastal Plan that maintains our quality of life here in Seal Beach. “1) continue to work closely with our police/fire/marine safety departments to keep our city and residents safe. “2) the opening of the pier and working with residents to move forward with next steps for what is wanted at the end of the pier. “3) keeping the momentum moving on the restaurant at 1st Street and plan for an opening in the very near future. “4) continue to work with the city and business owners to make our town a welcoming place to do business while maintaining our small town atmosphere. “5) work with the council to find ways to have cities up river help in keeping our beaches clean. “6) continue to be provide assistance for our residents when issues/questions arise while doing business with the city. “7) continue to work closely with the school district/ McGaugh Elementary to provide safe routes to/from school. “8) work closely with other local cities/jurisdictions to provide a voice and input for our city. “9) continue to work on keeping the city financially sound. “10) work closely with the other council members to represent the city in a highly professional manner to do the best job we can for the citizens of Seal Beach. “Long term public work projects . “Working with Cal. coastal commission, State Lands, other state agencies. “I wrote a whole page on opportunities and challenges only to find out that almost nothing in it would be happening until the end of this year or until 2020 (1st St. Restaurant, Shea Homes, DWP Park, 2nd & PCH and other LB development). District Five Councilwoman Sandra Massa-Lavitt (Leisure World) politely declined to participate on the grounds she was too busy.